Even if we can be assured the US took precautions to avoid hitting any Russian military targets in Syria during its recent strike, the potential for something to go wrong is far too great to risk. The Trump administration is more confrontational toward Russia than Barack Obama was, Glenn Greenwald and Zaid Jilani wrote in The Intercept recently. Pompeo wasn’t merely stating the blunt truth about an incident in February, in which US forces struck pro-government forces in Deir Ezzor, allegedly killing a large number of Russian mercenaries in the process. He was actively bragging about it to the Senate Foreign Relations Committee. However, the decision to strike Russian mercenaries was not given by Trump himself, having gifted the ability to his military commanders on the field to call in air strikes with zero oversight. In comparison, the decision to strike the Syrian government this past weekend was taken directly by the President, together with the rest of the hawkish Anglo-alliance, which also comprises the UK and France. Russia, of course, warned heavily against taking such a strike in the first place, and indicated that they would retaliate if they needed to by shooting down the missiles and taking out the launchpads in which those missiles emerged. Of course, the rationale for ordering such a strike in the first place has already been readily deconstructed by journalists who have managed to go and see the aftermath in Douma for themselves, including The Independent’s acclaimed journalist, Robert Fisk. It also pays to explain that even if there was concrete proof of a chemical weapons attack conducted by Bashar al Assad’s forces, a military strike on Syria would still be illegal without a United Nations Security Council (UNSC) resolution authorising the use of force. Before launching the strike, Trump took an unprecedented stab at Russia on Twitter, when reports first began emerging of an alleged chemical attack in Syria. Not long after the strike took place, Nikki Haley, Trump’s hawkish ambassador to the UN, announced the Trump administration was looking at slapping Russia with more sanctions due to its support for the Syrian government. Haley also warned should Assad’s forces launch a chemical weapons attack in the future, the US is locked and loaded to strike again in response. Not surprisingly, these developments have completely irked Russia and pushed relations between the East and the West, almost beyond a point of no return. The Russian Foreign Minister, Sergei Lavrov, accused the US of attempting a ‘genocide by sanctions’ against Russia, at a time of tense relations seemingly worse than during the height of the Cold War. It needs to be stressed repeatedly until the message becomes crystal clear: at no stage in recent history has there ever been a time where Russian forces and US forces were bombing the same country with complete polar opposite interests. This fact alone should be enough to convince readers that as a global society we have moved aeons backwards; not forwards, and we are headed towards something far more sinister than the corporate media will ever admit. Even if we can be assured the US took precautions to avoid hitting any Russian military targets in Syria during its recent strike, the potential for something to go wrong is far too great to risk. Russia will not be leaving Syria anytime soon, given it has one of its major strategic bases located there. Not to mention the fact that together with Iran, it looks set to reap all the “spoils” from the Syrian conflict, in the form of oil and gas contracts as well as reconstruction projects. So where will this foreign policy lead us in the not too distant future? Either the US will accept defeat in Syria and concede to Russia – which seems increasingly unlikely – or it will have to square off against the Russian military directly. Sanctions, as always, lay the groundwork for a direct confrontation between the US and a known adversary. But this war is well past its cold, sanctions-only phase, and has been in a hot war state for some time. The direct bombing of Russian-linked forces in Syria, not to mention the numerous times the Syrian government forces allied with Russia have been struck directly by US air power in the last two years, indicates this war is well into the confrontational stage. It would take something exponentially different to change the current trajectory we are on. 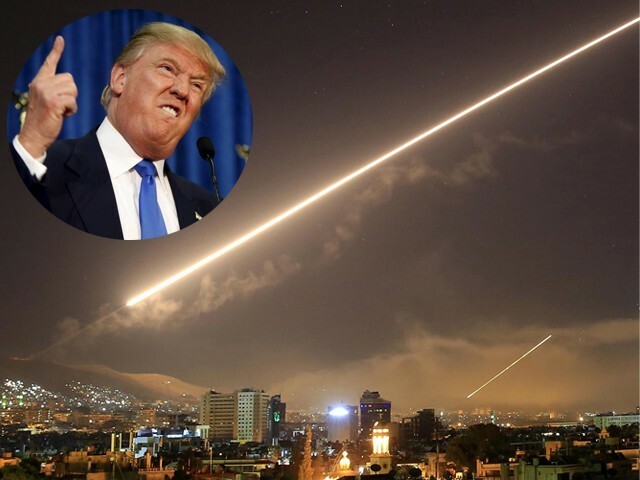 While the media made a grand display of the recent Anglo-alliance led strike on Syria, it also pays to remind that Israel, Washington’s key ally in the Middle East, continues to strike Syrian and Iranian military targets in Syria with much less publicity and scrutiny. Russia continues to show restraint in the face of Israeli aggression, as do Iran and Syria, but this too has the potential to spiral out of control. Not too long ago, Syria activated its air defences on an Israeli raid and successfully brought down an Israeli jet. The Israeli response was forceful and extensive, striking at least 12 alleged Iranian military targets in response. Israel has also been preparing for a full-scale invasion of Lebanon to take on Hezbollah in a greatly anticipated rematch; a conflict which will almost certainly spill over into Syria as well, given Hezbollah’s significant presence there. At the end of the day, there is good cause to oppose renewed military action in Syria – regardless of the potential for these developments to evolve into the greatest global conflict of our time – given the only people who seem set to suffer in the immediate short-term from this endless cycle of violence are the Syrian people themselves. Remember this: when Trump, Theresa May and Emmanuel Macron tell you they are primarily concerned with protecting civilian lives in Syria, all the while Trump himself is responsible for the deaths of deaths of thousands in his first year of office alone. Wrong title, the article premise for the third world war is not real. Nuclear powers cannot create world wars since it is a step towards their own annhilation. The renegrade three avoided to cross the Russian declared red line otherwise we would have witnessed the demonstration of Russian missiles in the meditranian and the atlantic.